Coins of the Carson City Mint: Comstock Lode, Carson City GSA dollars, and more! The Carson City Mint was built in response to the discovery of Nevada’s Comstock Lode. Coin collectors today prize Carson City coins and the Wild West history they represent. This chapter traces the story of the "CC" Mint, from its inception right up to modern times. Hit the "Saga of the US Mint Chapters" link at the upper right to choose other US Mint facilities to study. The headings directly below are units of the Carson City Mint chapter. 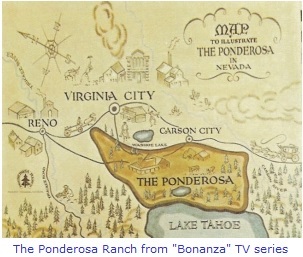 The "Bonanza" map of the mythical Cartwright's Ponderosa Ranch, surrounded by real life places, including Carson City. Note that the North direction is pointing to the left of the map. Fair use under US copyright law. Anyone who watched the classic TV western "Bonanza" probably remembers the opening scene where the map of the Ponderosa Ranch goes up in flames (and with the memory machine turned on, the bravado Bonanza theme music is soon bouncing around in your head!). While the Cartwrights might have been fictional characters, the geographical setting and historical underpinnings of the show were quite real. The Nevada territorial towns of Virginia City, Reno, and Carson City, as illustrated on the map in the general vicinity of the Ponderosa, actually did (and still do) exist. In one of the earliest episodes, a devious prospector named Henry Comstock was the first to stake a claim on the eastern slope of Mount Davidson (present day Storey County, Nevada), the place where fabulous gold and silver deposits were later found. 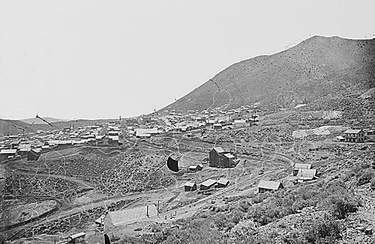 The discovery, called the Comstock Lode, brought thousands of miners to the region, touching off a veritable bonanza (hence the name of the television series), boomtown status for Virginia City, and a plethora of story lines for Ben, Adam, Hoss, and Little Joe, enough to last 14 seasons on the air. Interestingly, in one installment during the 10th year of the series, the Cartwrights befriended a group of disgruntled army veterans, unaware of the former soldiers' plan to rob the Carson City Mint, as revenge against the US government. But we digress. The Comstock Lode strike led to the rapid growth of mining boomtowns. One such boomtown was Virginia City, shown above, as it appeared circa 1867. Image courtesy of National Archives. The Comstock Lode and its fortune were not imaginary, however. History books are replete with exploits of the fabled finding, and to be sure, was an important factor in the settlement of the American West. Prominent in those rough and tumble times was the development of Carson City. Founded in 1858 by Abe Curry, only one year prior to Henry Comstock's initial claim, Carson City's growth accelerated dramatically as an important mining town while precious ore, mostly silver, was being uncovered nearby. In 1861, prosperous Carson City became the capital of the Nevada Territory, and remained the seat of state government when Nevada joined the Union in 1864, just as the Civil War was winding down. Most of the riches were shipped over the Sierra Nevada Mountains to the US branch mint operating in San Francisco, and then back again after being converted to coinage. This practice was very expensive and risky, as the trails were closely patrolled by opportunistic thieves. Moreover, the population of the Nevada mining district numbered in the tens of thousands, where the scarcity of hard money made routine financial transactions difficult. Against this set of conditions, Nevada Territory mine owners petitioned Congress for a new branch mint in their vicinity. Legislation to establish a mint in the Nevada Territory was approved on March 3, 1863. Thus began a magnificent American numismatic legacy. 1860s Carson City, the intersection of Second and Carson Streets. It was at this crossing that the Nevada state capital was eventually constructed. Six blocks to the north is where the Carson City Mint was built. Image courtesy of Library of Congress. The legislation did not specify where the new mint was to be built, only that it must be located somewhere within the Nevada Territory. Abe Curry, by now one of the most influential men in entire region, lobbied the government to choose Carson City as the site of the new mint. Curry stressed that since Carson City was conveniently located to the major mining operations, it would be an excellent choice to situate a coining facility. Based on this reasoning, Carson City was ultimately chosen to host the new branch mint. 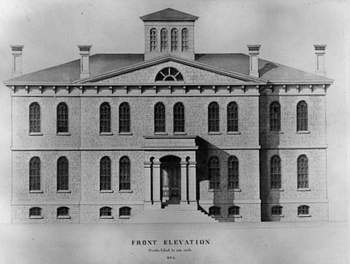 In September 1863, the federal government purchased Block 65 from private citizens in Carson City, for the purpose of constructing the coining facility. The Supervising Architect of the Treasury, Alfred B. Mullett, was the chief designer of the project, the first of his 8-year career with the Treasury Department. Mullet went on to become one of the most consequential architects of his time, and adjudged to be among his greatest achievements was the second San Francisco Mint, better known as the "Granite Lady". The long-awaited Mint drawings, specifications, and authorizing documents arrived in Carson City on July 17, 1866. Surrounded by considerable fanfare, the groundbreaking ceremony was held the following morning. Alfred B. Mullet's architectural drawing of the proposed Carson City Mint's front elevation. Image courtesy of Library of Congress. Not surprisingly, Abe Curry was named to oversee construction as the general contractor. The cornerstone was laid at Block 65 on September 24, 1866, a location that is today found at the northwest corner of Carson (Hwy 395) and Robinson Streets in Carson City. Mullett's design called for a two-story main building measuring 88 feet in width and 58 feet in depth, supported by a basement foundation. The chief characteristic of the front elevation was a 12 by 15 entrance porch. The main building was to be topped by an ornate brick cupola. The 86 feet by 27 feet single-story west wing was designated to house boiler house operations, an engine room, carpentry shop, and storage. Sandstone blocks for the exterior walls were readily quarried from the Nevada State Prison, but overall, the construction effort did not go smoothly. Delays in appropriations, cost overruns, inclement weather, and other setbacks, slowed progress to a crawl. Labor disputes also hampered building activity. Curry tried to keep expenses under control by hiring cheaper Chinese labor, but his decision triggered widespread protests from the local citizens. This flashpoint got so hot that Mint Director William Millward journeyed from Philadelphia to personally assess the situation. Under pressure, Curry relented and agreed to hire only Caucasian laborers at much higher wages. Finally, on December 13, 1869, the Carson City Mint was declared complete. Construction costs totaled $426,788, far above the $150,000 allocated for the project. The Carson City Mint building as it appeared in 1879. Image courtesy of Library of Congress. On December 28, 1869, the area was shaken by an earthquake. Many buildings in Carson City were destroyed, but the Mint survived intact. 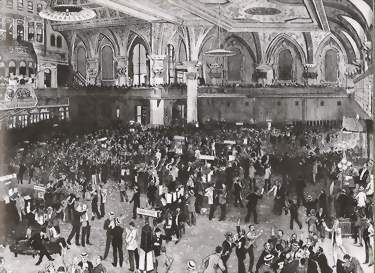 Evidently, the Mint was well-built, in spite of all the obstacles encountered during its construction. Wells Fargo delivered coinage dies from Philadelphia, the first ever bearing the "CC" mintmark, on Jan 10, 1870. Finally, the Carson City Mint was open for business. The reverse side of an 1870-CC Liberty Seated silver dollar. Theoretically, at least, this could have been the very first coin minted in Carson City. Photo courtesy of Ira & Larry Goldberg Coins & Collectibles, Inc., Beverly Hills, CA. The very first Carson City Mint coin to debut was the 1870-CC Liberty Seated silver dollar. On February 11, 1870, Mr. A. Wright, an individual who had earlier deposited silver at the Mint, received 2303 of these dollars. Three days later, gold eagles ($10 gold coins) were struck, followed closely by half eagles ($5 gold) and double eagles ($20 gold). Several denominations of US coins were never minted at Carson City, even though they were contemporaries of the Carson City Mint. These included all coins composed of copper and nickel, half dimes, gold dollars, quarter eagles, and three dollar gold pieces. Oddly enough, the most short-lived American coin series ever, the 20-cent piece, was in fact produced at Carson City. Actually, the 1876-CC is one of the rarities most cherished by modern day coin collectors, worth over $400,000 in top uncirculated condition. During its time of service, politics often impacted the status of the Carson City Mint. Years earlier, in 1834, the US government announced it would value silver and gold at a ratio of 16 to 1, (up from the 15:1 ratio established in 1792, see bimetallism). In doing so, Uncle Sam also continued to specify the weight of silver or gold to be coined into one dollar's worth of hard money. Anyone could bring their bullion to the Mint and receive "Y" dollars worth of coins in exchange for "X" ounces of bullion, based on these criteria. In effect, this practice set the price the government was willing to pay per troy ounce for silver and gold (example: a $10 gold eagle, containing .48375 troy ounces of pure gold, put the governmental value of gold at $20.67 per troy ounce). This worked well until the late 1840s and 1850s, when the supply of gold increased dramatically, upsetting the existing gold-silver balance (see California Gold Rush). Consequently, silver became more scarce relative to gold than before, meaning silver barons could sell 16 ounces of silver to private buyers, many of the foreign-based, for more than one ounce of gold. As a result, they often preferred to sell their silver this way rather than take it to one of the US mints for conversion into coinage. 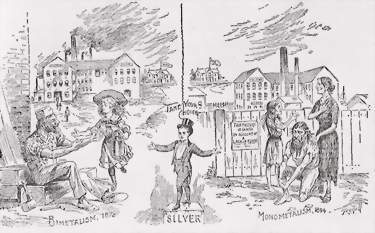 This political cartoon, sympathetic to the Silverites, prophesied that a gold standard would destroy prosperity by 1894. A severe economic depression did indeed hit the US in 1893, but as with all things political, the causes of the downturn were hotly contested. Public domain image. As the prolific Comstock Lode and mines in Colorado dumped silver into the open market, this situation reversed itself, and by the mid 1870s, private buyers were purchasing 16 ounces of silver for less than one ounce of gold. Recalling the Treasury's offer to buy silver at the ratio of 16 to 1, silver owners came to the Carson City Mint and other US mints, desiring their silver to be coined into dollars. Much to their disgust, they learned that Congress had already enacted the Coinage Act of 1873, eliminating the silver dollar, and in effect, demonetized silver and committed our country to a gold standard only. Silver advocates, or "Silverites," as they came to be known, denounced the law as the "Crime of '73". This touched off a bitter political feud between Silverites seeking the return of bimetallism, and the "Gold Bugs", those who favored the gold monometallism concept. Throughout the remainder of the 19th century and then some, this controversy dominated American political debate. 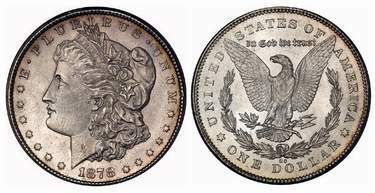 The issuance of the Morgan silver dollar in 1878 was a victory for silver advocates in their long standing feud against the Gold Bugs. Morgan dollars, just like the Carson City Mint product above, were well received in western states. Eastern power brokers viewed the white metal and the political movement behind it as a threat to their economic security. Photo courtesy of Ira & Larry Goldberg Coins & Collectibles, Inc., Beverly Hills, CA. Furious at the loss of a profitable market for their bullion, the "Crime of '73" became a rallying cry for groups, mostly from the West, insisting the government buy silver. The persuasive Silverites arm-twisted Congress to pass the Bland-Allison Act in 1878. This was not a full return to bimetallism, but under Bland-Allison, the Treasury Dept was required to purchase $2 to $4 million of silver monthly and mint it into dollar coins, in a quest to stabilize the price of silver at artificially high levels. The dollars were named after George T. Morgan, the designer of the new coin. 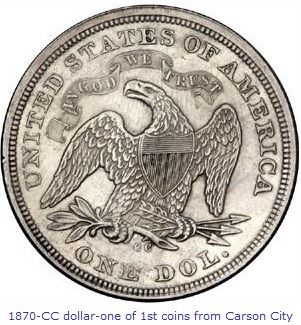 Accordingly, large quantities of Morgan silver dollars were minted, but many did not circulate well, especially in eastern states where silver was resented. Millions of the unused coins ended up in Treasury storage vaults for decades. Grover Cleveland (left) squared off against Benjamin Harrison in the 1888 election, with Harrison thwarting Cleveland's bid for re-election. The voters returned Cleveland to office in 1892, the only president ever elected twice to non-consecutive terms. The election of 1884 sent Democrat Grover Cleveland to the White House. At that time, the top Carson City Mint officials had been placed there by Republican presidents, and were loyal members of the GOP. In September 1885, Cleveland fired all mint employees and completely shut down the facility. The doors reopened a year later, but only to function as an assay office. When Benjamin Harrison recaptured the presidency for the GOP in 1888, the Democratic appointees were replaced by Republicans. In 1889, Carson City was allocated funds to resume coining operations. The Bland-Allison Act was modified by the Sherman Silver Purchase Act of 1890. The Act mandated a government purchase of 4.5 million ounces of silver each month, to be paid for with Treasury bonds redeemable in either gold or silver. Unexpectedly, most bond holders redeemed their notes in gold, depleting the Treasury’s gold reserve and throwing the entire country into a severe financial panic in 1893, leading to the repeal of the Sherman Act and greatly slowing the production of silver dollars. This is explains the scarcity of silver dollars minted in the years 1893 through 1895. May 5, 1893, stock values on the New York Stock Exchange suddenly spiral downward, plunging the United States into a severe depression. Thousands of businesses and factories closed their doors. Among the Panic of 1893 casualties was the Carson City Mint, viewed by Treasury Department officials as expendable. Public domain image, from August 12, 1893 Harper's Weekly. Simultaneous to the national political and economic developments of the 1890s, the once plentiful Nevada silver mines were tailing off. 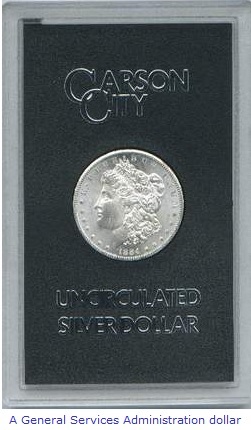 Add to that a persistently low silver price, the already mentioned national economic crises, and whiff of scandal (a Mint employee was accused of attempting to smuggle out gold bullion in a lunch box), it came as no surprise when on June 1, 1893, Mint Director Robert Preston ordered a cessation of coining operations at the Carson City Mint. 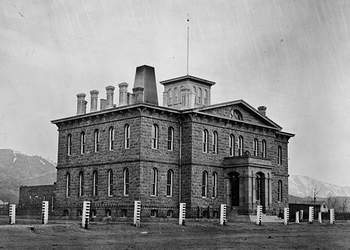 Because the facility was to remain open as an assay office, many assumed that when conditions improved, coins would once again emanate from Carson City. But, sadly, as we now know today, the world had seen the last of the "CC" coins. 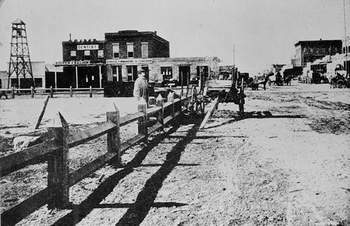 One of the busiest banks in 1890s Nevada was the Bullion and Exchange Bank. The bank was set up as a clearinghouse for other Nevada banks for bullion, coins, drafts, checks, and other valuables. Taking advantage of its friendly connections with Carson City Mint officials, the B&E Bank opened an office inside the facility. Shortly after Carson City's coining charter was suspended in 1893, B&E took over control of refining operations. One day in 1894, Chief Melter Hirsch Harris observed that the the tiny amount of naturally occurring gold in a few silver bars had been replaced by copper. The inquisitive Harris checked deeper and found more bars robbed of its gold content. The US Treasury Department was then notified of the gold's disappearance, touching off a full investigation. The Carson City building where the gold heist trials were held (1940 photo). 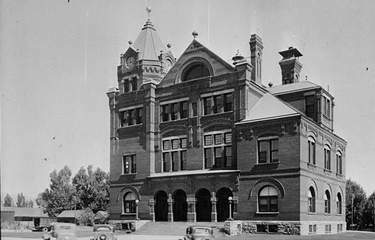 Upon completion in 1891, the structure was originally occupied by the Post Office, land office, United States Courts, and a Weather Bureau office. Image courtesy of Library of Congress. The probe revealed that several mint employees were systematically skimming off gold bullion during the refining process. Dating back to 1892, when the Carson City Mint was still a full fledged US branch mint, an estimated $75,000 in gold was stolen (equivalent to a cool $1.75 million in today's dollars). Several high profile trials were held, one ending in a hung jury. When it was learned that a key witness was bribed to remain silent, another trial was held. In the end, James Heney, John T. Jones, and Henry Piper, all former mint employees, were found guilty and sentenced to lengthy prison terms. Throughout the ordeal, the public largely suspected there was a connection between the gold theft and the Bullion and Exchange Bank, suspicions which were reinforced when bank president Jacob Klein leapt to the defense of the accused. Investigators carefully sifted through mountains of financial documents, but could find no evidence of criminal wrongdoing on the part of B&E. Nevertheless, Klein's smug association with the unpopular defendants led to his eventual ouster as bank president. The incident had several major repercussions. For one, the hope that Carson City would again someday coin money was forever dashed. Almost since the day of its inception, a shadow of scandal darkened the Mint's reputation, and this time, Washington officials said "enough!". On April 18, 1895, the Carson City Mint was closed. 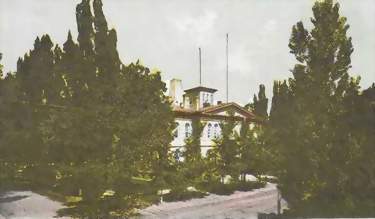 A postcard view of the old Carson City Mint, much as it must have appeared at the time three of its former employees were being convicted of stealing gold from the facility. Public domain image. On a national scale, the crime heightened awareness that even in a free capitalistic environment, some regulation of banking and industry is necessary. The 1890s Carson City Mint scandal helped Uncle Sam to better define his role within the realm of governmental oversight responsibility, business accountability, and compliance with the law at the individual level. Some historians argue that with the successful prosecution and imprisonment of at least some of the conspirators, the United States took a giant step forward in achieving an orderly, lawful society. An interesting footnote to this story is that when an old Carson City bank building was being demolished in modern times, workmen stumbled across a cache of hidden Bullion and Exchange Bank documents from the years the Mint gold bullion heist was being played out. Historians quickly descended upon the finding, hoping at long last to uncover the truth: did the B&E Bank have a hand in the infamous misdeed? After raking through the papers with a fine-tooth comb, the frustrated researchers announced the bank's role in the scandal still could not be fully ascertained. No one knows why the documents were concealed, but they certainly did not hold the proverbial "smoking gun". The mystery will probably remain unsolved forever. The 1884-CC above is an example of a GSA Morgan silver dollar. Most of the dollars sold by the GSA had been stored unused in government vaults since 1899, when the Carson City Mint officially lost its status as a US mint. Because of the somewhat random nature of how the coins were distributed by the GSA, a few lucky buyers received coins that later merited a very high numerical grade. The Treasury Department permitted the Carson City Mint to reopen in June 1896, limiting its activities to refining precious metal bullion. This reduction in status was formally conferred upon the facility by Congress in 1899, whereupon its coining machinery was removed and sent elsewhere. Some 22 tons of unused "CC" silver dollars (approximately 750,000 of them) were emptied from the (former) mint's vault and shipped back east. Most of them remained in storage until the 1970s, when the General Services Administration (GSA) began packaging each dollar individually and offered them for sale to the public. In today's market, silver dollars in their original GSA enclosures actually carry a small premium. From its opening in 1870 to the shutdown of coining operations in 1893, the Carson City Mint yielded nearly $50 million of coins in face value. The Carson City facility continued to refine gold and silver ore rather uneventfully for many years. While the old "CC" Mint toiled in relative obscurity, the United States as a nation stepped onto the world stage, rising to great heights militarily and economically, and contributed mightily in the preservation of democracy in the "War to End all Wars". In 1933, as the country was mired in the depths of the Great Depression, the facility was closed as a cost cutting measure. When the last employee turned out the lights and locked the doors, no one knew for sure the destiny awaiting the historic building. THEN and NOW. Two opposing views of the Carson City Mint building, The photo on the left taken not long after the facility opened in 1870, and on the right as it appears 140 years later. The historic mint building is now the home of the Nevada State Museum. Images courtesy of Library of Congress and Joel Mitchell, Modesto Coin &Bullion, Modesto, CA. In 1941, the old Carson City Mint building was resurrected to become the new home of the Nevada State Museum. Still going strong today, the museum offers a diverse range of exhibits. Museum patrons witness the history of the Silver State, beginning from prehistoric times through its frontier days. A walk-through ghost town and a recreated underground mine demonstrate what it must of been like for 19th century prospectors. The Native American culture and Nevada fauna are likewise featured in several displays. Oh, yes... the museum also traces the history of the Carson City Mint, from its creation to its anticlimactic ending. Coin collectors will salivate at the sight of a complete assemblage of "CC" Morgan silver dollars, and other rare coins struck within these same confines over a century ago. Venerable Coin Press #1, a charter member of the "CC" Mint, is still used to this very day to produce medallions. Image courtesy of Nevada State Museum. The centerpiece of the numismatic section is "Coin Press No. 1". A steam-powered press manufactured in Philadelphia, Coin Press No. 1 struck the very first "CC" mintmark coin in 1870, the Liberty Seated silver dollar. After the Carson City Mint halted striking operations in 1893 and all coining machinery removed in 1899, Press No. 1 was relocated to the Philly Mint. In 1930, it was upgraded to electrical power. When the San Francisco Mint needed another press in 1945, No. 1 was then transferred to the Golden State. In 1955, the press was slated to be scrapped, but a group of businessmen arranged for the state of Nevada to purchase it for $225. Three years later, Coin Press No. 1 was welcomed back to familiar surroundings in Carson City, where it quickly became one of the museum's favorite attractions. Believe it or not, the days of active duty were not over for Coin Press No. 1. 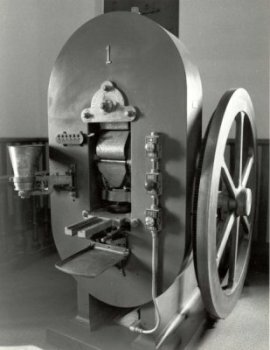 Confronted with a national coin shortage in 1964, the legendary machine was shipped to the Denver Mint and pressed into service. Over the next three years, No. 1 struck more than 118 million coins before again retiring to its Carson City home. After undergoing a conversion to a slower electric drive, Coin Press No. 1 has been used since 1975 to produce a series of commemorative and souvenir medallions in both silver and brass. More recently, in January 2006, No. 1 was activated again to strike medals commemorating the release of the Nevada State Quarter. For numismatic devotees, coins of the Carson City Mint hold a special appeal. Long associated with romantic Wild West imagery, the thrill of owning rare coins made of gold or silver mined from the Comstock Lode is a slice of Americana every collector dreams about. Thanks to its unique place in history and a rich heritage of "CC" coins bequeathed to this and future generations, the memory of the Carson City Mint will rightfully live for ever more. As a new park was being developed on museum grounds in January 1999, a startling secret was unearthed. Hundreds of coining dies from the Carson City Mint's heyday were found buried under a shallow layer of dirt. Used to stamp coin images onto gold and silver planchets, some of the "CC" dies were from the 1870's. Examples of the unearthed dies, secretly buried until discovered in 1999. These particular dies were used to mint 1876-CC half dollars. Image courtesy of Nevada State Museum. The unexpected finding initiated a review of old records to sleuth out an explanation on how and why the cancelled dies were discarded in this fashion. The best theory is that at the end of the federal fiscal year every June, books were balanced and an annual clean-up inside the Mint took place. Dies from the previous year were secretly buried in a trench dug inside a wooden shed next to the Mint's blacksmith shop, and covered with a thin layer of trash and dirt. To thwart potential counterfeiters, all the dies were cancelled by chiseling a slash or "X" across the die face prior to burial. The wooden shed was demolished many years ago, but the covered trench successfully concealed the die dump site until 1999. A close up view of the famous "CC" mintmark. Photo courtesy of Ira & Larry Goldberg Coins & Collectibles, Inc., Beverly Hills, CA. Most of the dies found are heavily rusted and in poor shape. Small wonder, for metallic objects buried for over a century. A few of them are serviceable, however, and have been used to stamp coin impressions on silver bars and other items for collectors. One of the cancelled die dates utilized for this purpose is that of an 1876-CC Liberty Seated half dollar. Probably more than just a few coin collectors fantasize about these artifacts magically restored to their original condition, so that more coveted "CC" coins could roll off the presses once again. The reality is, of course, the existing supply of Carson City Mint coins is fixed at best, and can never increase. Given the relatively small mintages and long-standing popularity of the coins issued by the illustrious Nevada branch mint, its a safe bet most of us will just have to keep fantasizing. 1 Doty, Richard. America's Money, America's Story. 3 Jordan, Winthrop D., Miriam Greenblatt, & John S. Bowes. The Americans. Evanstan, IL: McDougall, Littell & Company, 1988. 7 Von Klinger, Eric. "Discovered Dies by the Hundreds". Coin World, November 10, 2003, pg 96. 8 Winter, Douglas, and James Halperin. Gold Coins of the Carson City Mint. Ivy Press Books, 2001. 9 Wolman, Paul. The U.S. Mint. Chelsea House Publishers, New York, NY, 1987.